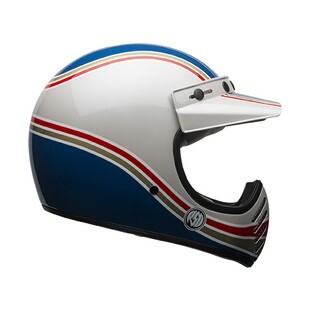 Working off of the classic color-scheme rocked by great motor-heads including Evel Knievel, the Bell Moto-3 RSD Malibu Helmet follows a theme that has been consistent throughout this season’s launch: balancing classic style with modern form. There have been a lot of advancements in helmet technology since the early days of riding, and as far as protection goes the Moto-3 RSD Malibu is as modern as it gets. Constructed with a lightweight fiberglass composite shell, the Moto-3 RSD Malibu is both DOT and ECE certified. The collaboration between Bell and RSD has produced a stylish product that is fit for any type of rider, dirt or street, scrambler or chopper. Bell has a knack of succeeding at taking you back to a bygone era (that you may not have even lived through) and if anything is proof of that, it’s the Moto-3 RSD Malibu Helmet.